1. Pentagon has planned to establish a new wall at which of the following border in order to prevent illegal migration and drug trafficking? 2. Name the Bank,which received a capital infusion of Rs 5,042 Crore from the government recently? 3. Tashigang,became the world’s highest polling station belongs to which state? 4. Name the hyper-local connectivity app, launched in Mumbai which is used to connect the users to their neighborhood people. 5. According to the “State of the Global Climate in 2018” report,released by World Meteorological Organization (WMO),2018 was ________ warmest year? 6. Which country has signed security agreement with Qatar for ensuring safety in the FIFA (The Federation Internationale de Football Association) World Cup 2022 event? 7. Who is the author of the book titled “Indian Fiscal Federalism”? 8. According to a recent report by Oxfam, which country has the highest gender wage gap among Asian nations? 9. As per the report titled “‘OpenSignal’s hottest city for 4G Availability”,which city topped in India? 10. Where did 16th meeting of the U.S. India Counter terrorism Joint Working Group held? 11. UN Security Council passed a new Resolution 2462 in order to combat which of the following issue? 12. Which Automotive company has developed the ‘largest power storage system in Asia’ installed in Osaka train station in Japan? 13. How much billion(approximately) is accepted by Reserve Bank of India(RBI) from banks at its currency swap auction to ease liquidity? 14. What is the new average base rate set by Reserve Bank of India(RBI) to be charged by Non- Banking Financial Companies (NBFC) and Micro Finance institutions(MFI) for the first quarter (April to June)? 15. What is the interest rate of girl child savings scheme “Sukanya Samriddhi Yojana account”? 16. 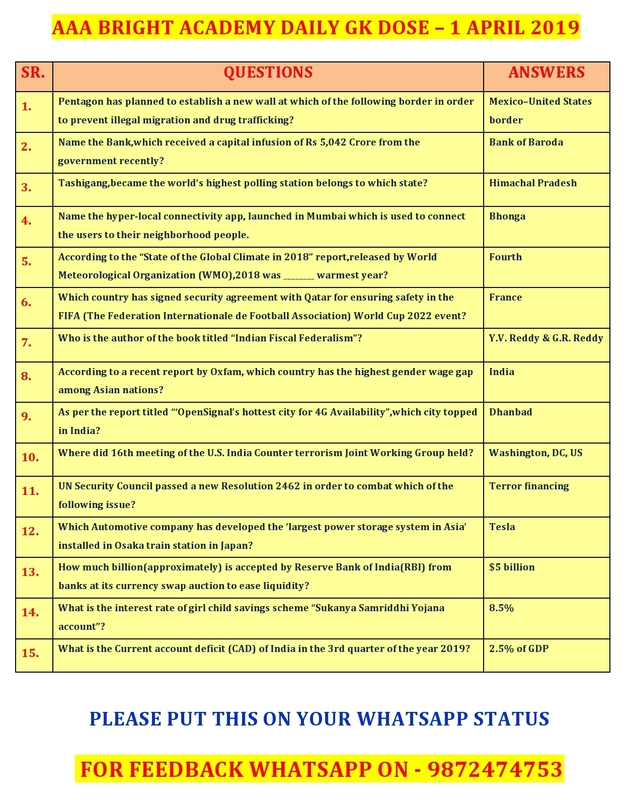 What is the Current account deficit (CAD) of India in the 3rd quarter of the year 2019? 17. Who was conferred with the Pravasi Bharatiya Samman Award 2019 for his magnificent achievements in the field of science, education and medicine? 18. Which Indian organisation has decided to set up a regulatory sandbox for Fintech startups? 19. Which railway station has received Gold Rating by the Indian Green Building Council (IGBC)?